I hope that in some small way this blog stops others from doing stupid things I do. Like relying on the kindness of strangers. Ok. That’s not true. I was channeling A Street Car Named Desire for a moment. Let us get back to Christmas shopping. As many of you know, I live in a smaller town. It can be difficult to find the things my children have asked for for Christmas. Luckily, we live in a time of modern wonderment and I’ve ordered almost everything online. I’ve been feeling wonderfully brilliant. Shopping done. Hiding done. Life is sweet. Then I decided to check the box of pajamas. We have the tradition of getting new pj’s Christmas eve. Some years we have a theme and some years the theme is “Found on the Clearance Table.” That is my personal favorite theme, but not the kids’. This year I went all out. I ordered completely matching pajamas. All five of us will be wearing the same shirts and pants. Blue tops and blue and green flannel bottoms. We are going to look like complete idiots. But my daughter thought it would be fun and there are stores out there dedicated to this stuff. The pattern I really wanted was sold out, but let’s face it. When an adult wears the same pj’s as a 6 year old, the pattern doesn’t save that much ego. I opened the box. Only three pairs of pajamas were inside. I looked for another box. I read the label on the box and it said only one box would be delivered. I was in shock. The completely nameless people I put all of my faith and trust in made a mistake. How could this be? Just because half of the U.S. has this pajama tradition and probably half of them use this company, how could their overworked and underpaid employees make this mistake? Where are the Christmas miracles when you need them? I frantically called the company and they apologized and I’ll get the adult pairs in 2 days. I should’ve asked for a bar of chocolate too but I don’t think the company sells food. They should. Flannel pj’s need chocolate. 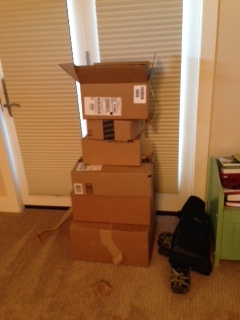 Then I opened every single box I’d had nicely stacked in plain site in my bedroom. Then I realized that I had no memory of what I’d ordered and I didn’t want to go back through all of the emails and figure it out so I’ve decided I received everything else. It’s not as neat now. And some of the boxes are upside down. The biggest one is mine, though. So don’t worry. I’m not spoiling the kids. I’ve also decided I’m going back to “Clearance Table” theme next year. It’s so much easier, way cheaper, and we look 10% less like mutants. PreviousElf on the Shelf or Spawn of Satan?NextMerry Christmas!